Cancer is debilitating and traumatic, and even more so in young children. Unfortunately, this is the reality in many families. Monday 4 February is World Cancer Day and this year the focus is on the importance of early detection – something that can drastically increase survival. 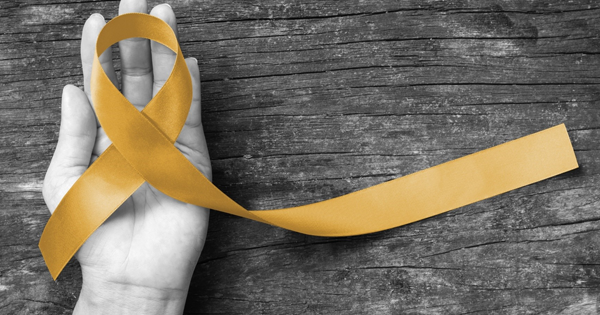 South Africa has some of the lowest survival rates when it comes to childhood cancers, according to the Childhood Cancer Foundation of South Africa (CHOC). Each year, around the world, more than 300 000 children from birth to 19 years of age are diagnosed with cancer. Approximately eight in 10 of these children live in low and middle-income countries where their survival rate is less than 20%. This is in stark contrast to high-income countries, where cure rates exceed 80% for many common childhood cancers. In South Africa, we should be diagnosing around 2 500 children per annum, but unfortunately the figure is only about 1 500. And among those who are actually diagnosed, the survival rate is as low as 55%. This means that in South Africa every year, only around half of the children who are diagnosed will survive. In September 2018, in the United Nations General Assembly, the World Health Organisation (WHO) announced its new global initiative to address the disparity between childhood cancer survival rates in lower- versus high-income countries. One of the tactics to increase the percentage of childhood cancer survival is an awareness of how the different cancers can manifest and how to spot the symptoms early enough. 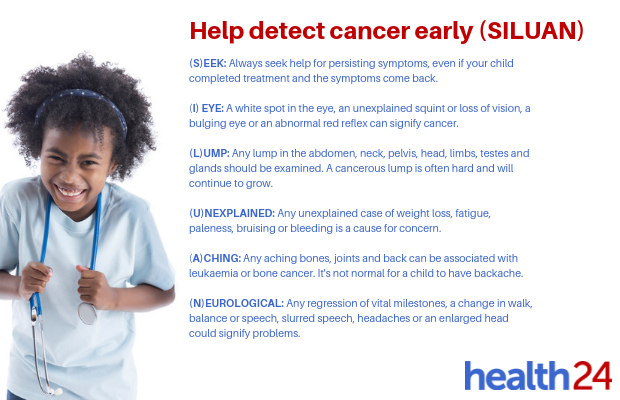 According to CANSA, the reason for the low survival rate and lack of early detection could be a lack of knowledge and awareness, as well as the stigmas, superstitions and myths regarding childhood cancer in certain cultural groups – there is often a belief that cancer has supernatural causes. The aim is to reduce these stigmas and myths, and to create awareness regarding symptoms and early detection as we approach Childhood Cancer Day on 15 February 2019. According to the Union for International Cancer Control (UICC), early detection could also result in less intensive treatment, which can relieve the financial burden on families. CHOC formulated the acronym SILUAN to help map different signs and symptoms that could be cause for concern: Children will not always be able to articulate symptoms accurately, so listen carefully if they complain about any particular pain or feeling, and don’t take it lightly. Do not hesitate to reach out to CHOC for support and additional information.